For about a year I’ve been seriously thinking about converting the seldom-used guest bedroom to be My Space. Up to now it’s been used as a guest bedroom, home office and holding area for Christmas presents. Work – 80% of the work I do for Web Instinct is done at home. I also use my office to pay bills and manage all of the things needed to run the family and household. Creating – I am currently working on a quilt, crocheting an afghan, knitting an afghan and a scrapbook for Justin’s upcoming graduation. The ability to walk away from a project, without having to put everything away, and continue working on it is HUGE. Relaxing – sometimes I just want a space where I can curl up with a book or watch the Food Network or HGTV in peace. Right now the space doesn’t reflect my personality and isn’t set up the way I want it. I am so excited because I found fabric that I love. 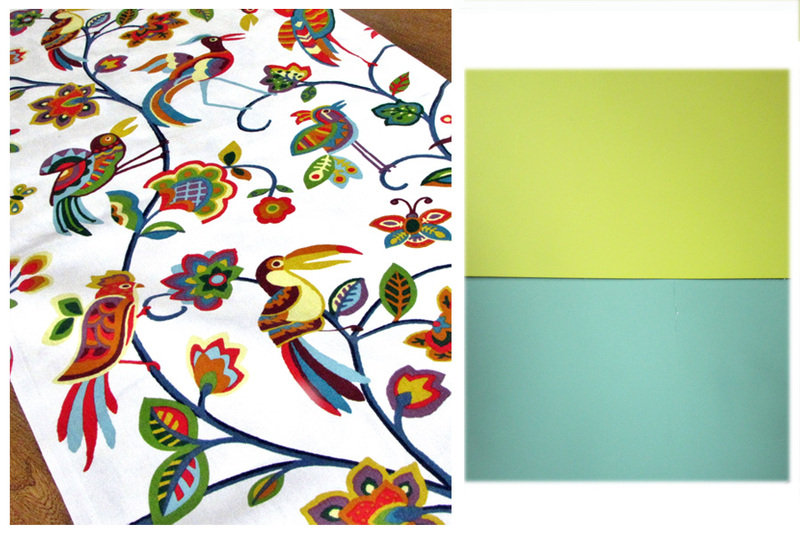 This fabric is my inspiration for the colors that will be used in the room. I’m going to make panels for the windows with the fabric. The fabric, printed duck, was $8.99/yard at the Hobby Lobby. 8 yards cost me roughly $72. I used my smartphone to go to the Hobby Lobby website while the fabric was getting measured and downloaded a 40% off coupon. I ended up paying about $45 for the fabric. Awesome! Ready to see the wild a** fabric I bought??? Here it is. Yup. Birds. Lots of ’em. And I love it. Both paint chips are Olympic paints – Forsythia Blossom and Royal Palm. I’m not sure how the paint will work out. I’ll post pics of the room when it’s finally done. Kim, I LOVE the bird fabric!!! It’s fabulous! Great paint colors too! Can’t wait to see how it all comes together!